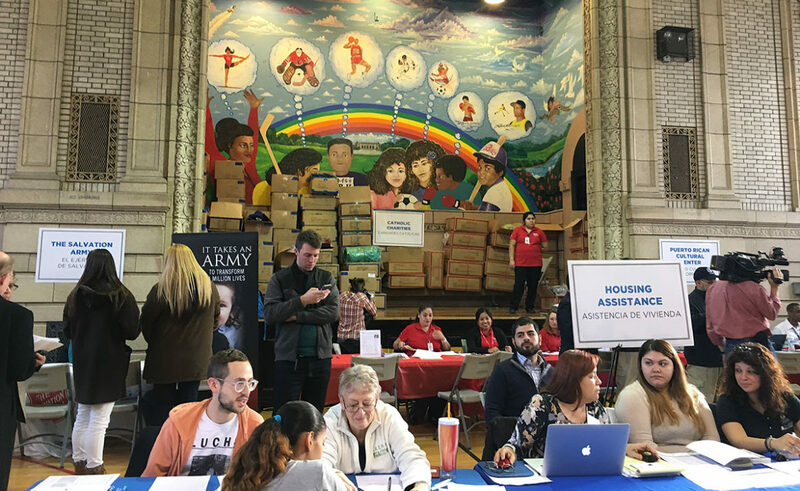 Service providers offer housing assistance and other aid to Puerto Rican evacuees at the Humboldt Park Field House’s Hurricane Resource Center in Chicago. Update Sept. 4, 2018: The Federal Emergency Management Agency’s Transitional Shelter Assistance program will end Sept. 13, according to an August 30 ruling by a federal judge in Massachusetts. The program had been extended several times during the summer through a restraining order obtained through a class-action lawsuit filed by the civil rights group LatinoJustice PRLDEF. The federal judge told FEMA to work with residents to help them find alternative housing, though there is no binding requirement that FEMA do so. In the weeks and months after Hurricanes Irma and Maria struck last September, hundreds of Puerto Ricans fleeing the devastation on the island arrived in Chicago, already home to more than 100,000 Puerto Ricans, the largest such community in the Midwest. The evacuees streamed in to a welcoming center set up in a park fieldhouse by Puerto Rican activists, city officials and nonprofit agencies in the Humboldt Park neighborhood. Para leer este artículo en español, hazle un click aquí. The Federal Emergency Management Agency’s Transitional Shelter Assistance (TSA) program is meant to help in exactly these situations, providing immediate emergency housing for evacuees by paying for their stays in hotels. The program was originally scheduled to end on January 13, but it has been extended several times and is now available until June 30 for families already using the program who meet eligibility requirements. As of April, seven months after the hurricanes, a total of only 67 households had been put up in hotels through the TSA program in Illinois, according to FEMA data, which defines a household as a single individual, couple or family. TSA appears to have been more effectively administered elsewhere. There are currently about 2,450 families who are checked into a TSA participating hotel in 31 states and Puerto Rico. Up to April, FEMA said it has spent more than $55 million nationwide reimbursing hotels for more than 7,000 TSA recipients as a result of of Hurricanes Irma, Harvey and Maria. But it did not provide an amount reimbursed to Illinois hotels. In response to a Freedom of Information Act request for such information, FEMA sent an incomplete spreadsheet showing $23,000 paid to four Illinois hotels to accommodate 14 households. FEMA spokesman Daniel Llargués explained that after people apply for FEMA aid, if they are found eligible for TSA they are notified by a phone call within 48 hours. Anyone who applies for FEMA aid is screened for TSA eligibility, which is typically granted if their home was made uninhabitable by the disaster and they have no other housing options. FEMA’s most recent Illinois data on total applications comes from late 2017, when 498 households were found eligible for TSA out of 643 who had applied for general assistance. Elected officials, including 26th Ward Ald. Roberto Maldonado, Secretary of State Jesse White, Chicago Mayor Rahm Emanuel, Rep. Luis Gutiérrez, and 1st Ward Ald. Joe Moreno, welcome Hurricane Maria survivors at a press conference at the Humboldt Park Fieldhouse on Nov. 27, 2017. Roberto Maldonado is alderman of Chicago’s 26th Ward, which includes the city’s main Puerto Rican neighborhood, Humboldt Park. He helped set up the hurricane relief center in the fieldhouse, which shut down May 1 but in the months immediately after Maria saw as many as 100 people a day. Here, housing agencies and other service providers offered assistance and guidance navigating the Chicago bureaucracy, and FEMA staffed a table where people could apply for federal aid that could include TSA assistance. Maldonado said that while he appreciates the individual FEMA employees’ efforts, he could tell from early on that the process would not go smoothly. Maldonado can’t say for sure how many people have tried to use the program, but he says he can tell not enough are getting the help they need because of the “hundreds and hundreds” of Puerto Rican evacuees on the wait-list for subsidized housing managed by the Chicago Housing Authority. According to a CHA spokesperson, 105 evacuees have leased units and another 50 are in the screening process for housing via CHA’s Disaster Victims Waitlist, which gives families displaced by a natural disaster priority over others on the list. Some seem to have confused TSA with the housing program run by the city. For example when Grisel Santos, a 31-year-old optician, arrived in Chicago in October, she and her husband were eager to find housing for themselves and their young son as soon as possible. Santos had heard of the TSA program. But a woman from the church she had joined in Chicago told her that she would be put on a waiting list if she pursued that option. So she decided to abandon the idea, she said; with help from the church she and her family eventually found temporary housing on their own in suburban Cicero, Illinois. In reality there is no waiting list for TSA if one is found eligible. Omar Torres-Kortright is the executive director of Segundo Ruiz Belvis Cultural Center, in Chicago’s Hermosa neighborhood. Three days after Hurricane Maria hit, the center hosted a benefit for the Puerto Rican Agenda advocacy group that raised more than $70,000 for hurricane relief. Their fundraising continues, but that initial sum was used to purchase emergency supplies — water, solar lanterns, batteries, and more — which were shipped to Puerto Rico on two planes donated by United Airlines in late September, one of which returned with 300 evacuees. “I know for a fact that I could have alleviated people’s situations significantly if the program had been announced earlier. I had people who needed this,” he said. If it was better-administered, he said, TSA could be “a huge resource.” FEMA says “messaging” was sent by the National Business Emergency Operations Center in Washington, D.C. to the American Hotel and Lodging Association asking them to communicate and encourage participation into the TSA program. It is unclear how effective this was. 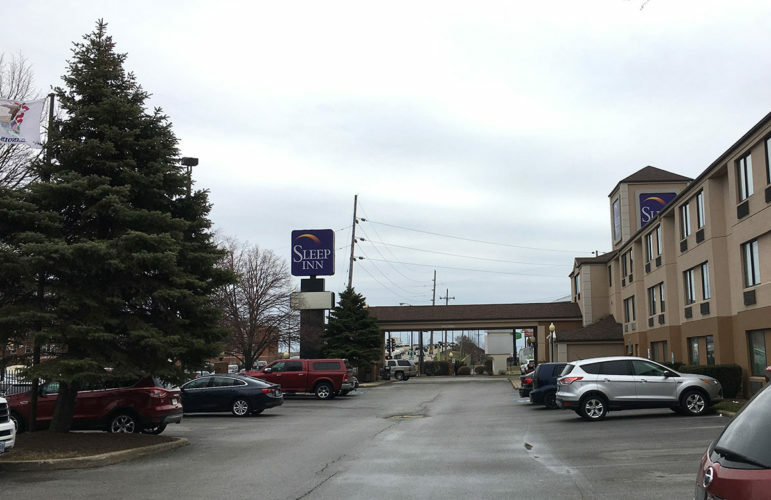 The Sleep Inn near Chicago’s Southwest Side and Midway Airport is one of several hotels that FEMA will pay for evacuees in Illinois to stay in through the Transitional Shelter Assistance (TSA) program. The experience for evacuees who did participate in TSA in Illinois was in some cases positive. 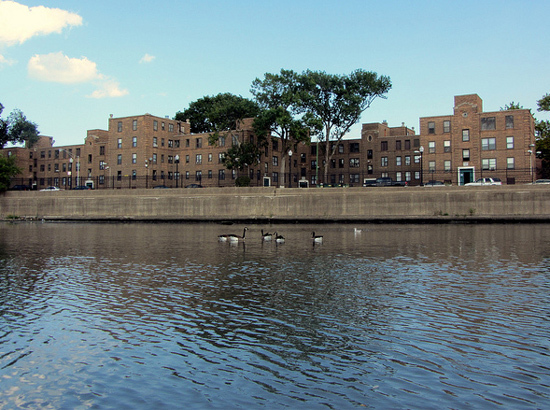 Unlike in New York City where the Center for Investigative Reporting in Puerto Rico revealed people being housed in shelters and marginal housing — such as one site identified on the TSA website as a bed and breakfast but appeared on investigation to be a daycare — the hotels available in Illinois are all major brand-name companies. Visits to several found comfortable conditions including free breakfast and sympathetic staff. The rest of her family, including four sons and her elderly parents, stayed behind. When she arrived in Chicago, Roldán sought assistance at the Humboldt Park welcoming center, and she was told about TSA by a FEMA representative there. On November 7 she moved into the Sleep Inn in Bedford Park near Chicago’s Southwest Side and Midway Airport. She stayed there for more than three months, before moving to an apartment on the city’s West Side on February 14, 2018. As of April 29, the Hyatt was not listed in the FEMA database of Illinois hotels participating in the TSA program; Lewellin said that at that time they did not have any rooms available. 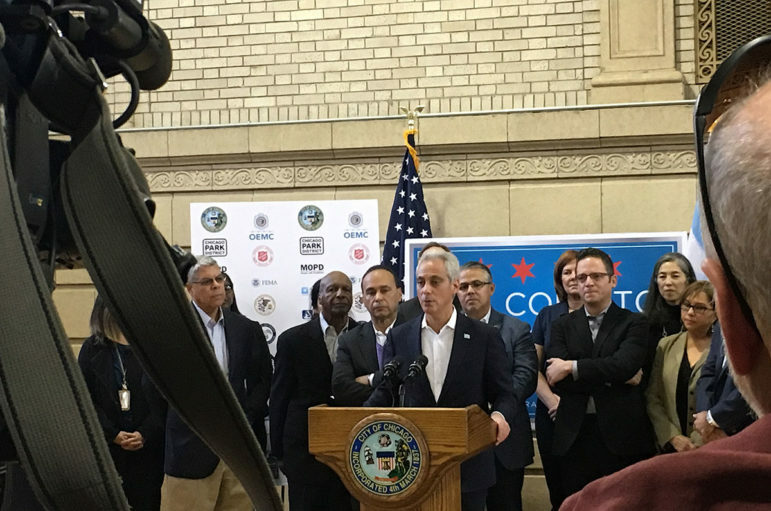 Maldonado and Torres-Kortright said FEMA should have recruited more hotels in Chicago to agree to host participants, especially in the weeks right after Maria. “There was no urgency given to it. It’s one of the things that they [FEMA] boast about, that they put people in hotels, but they don’t actually do it,” says Torres-Kortright. This story was published in collaboration with the Center for Investigative Reporting in Puerto Rico and the Medill School of Journalism. Contributing reporting by Carla Minet, Hannah Wiley, Gwen Aviles, Isabel S. Dieppa and Jessica Villagomez. Martha Bayne is a freelance writer in Chicago, a senior editor with Cleveland-based Belt Publishing, and associate editor with the Social Justice News Nexus program at Northwestern University's Medill School of Journalism. Follow her on Twitter @marthabayne. 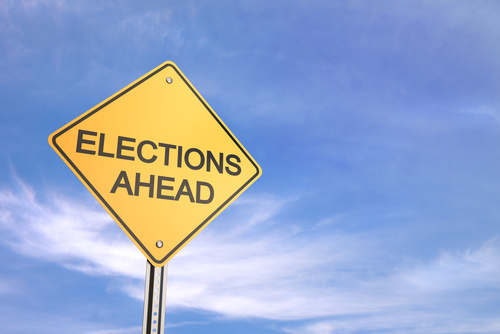 Chicago residents seek to ensure that politicians eyeing a City Council seat will keep their promises of change and not immediately align with the mayor. Thirteen aldermen have introduced an ordinance to increase oversight of the Chicago Housing Authority as pressure mounts over continuing revelations of the agency’s hoarding of resources and failure to provide housing. Meanwhile, evidence of the need for local oversight mounts.